Out of all the years that Heather's and my families have been coming together to decorate our Christmas tree, this is my favorite photo. Early in our friendship, I found out that Heather, my most artistic and Jewish friend, had always desperately wanted a Christmas Tree growing up. 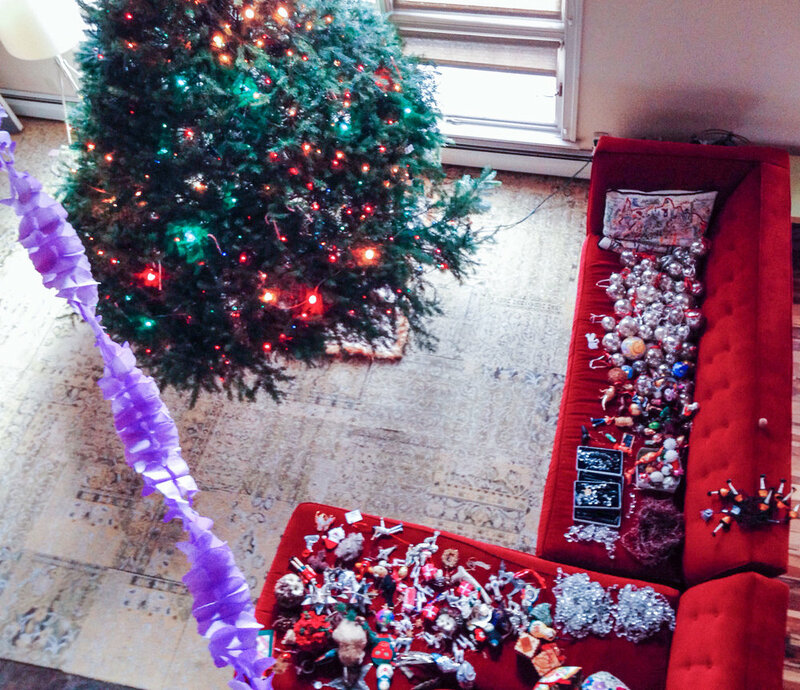 The solution seemed obvious: Invite Heather and her family to join us when we decorated our tree! It gave me an opportunity to share a tradition with someone who had never experienced it before, and fulfill a lifelong dream at the very same time. This photo, with Heather basking in the glow of a decorated Christmas Tree and the Menorah lit in the foreground, reminds me of how much our lives can be enhanced and enriched when we're open to sharing what we cherish most to create new experiences. We all love getting gussied up for a party (even when it's an outdoors event! ), and the Tree Trimming is no exception. The kids and I always break out the finery to show that it's an extra special moment, and my younger ones feel a sense of pride when they pick out their own outfits in advance. 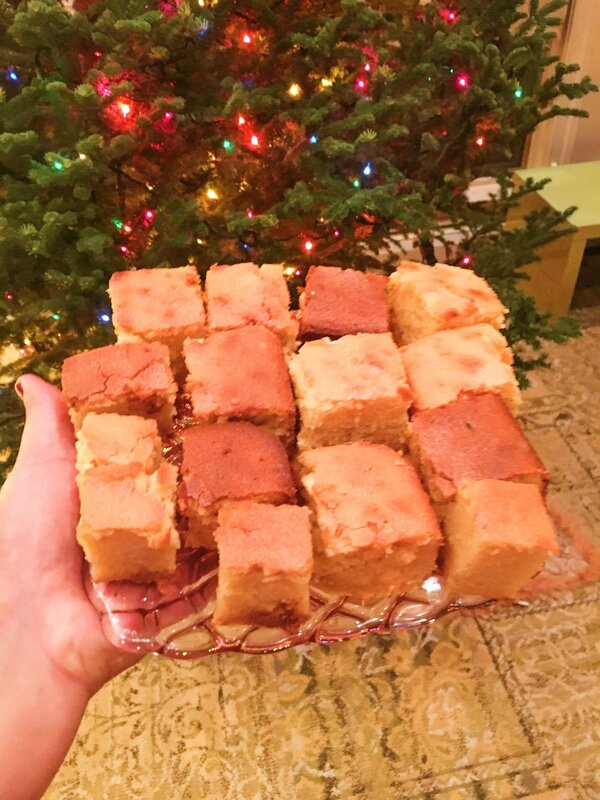 Food is a big part of any celebration, so we make sure to have plenty of finger foods (an important detail, since everyone is standing and moving around) like this delicious Butter Mochi recipe inspired by the dearly departed Lucky Peach magazine. And of course, there's always champagne on hand. The kids also love to make "mocktails" so they have something to sip on, too. It's a little more fun than Martinelli's and it keeps everyone involved! This is a tradition that was passed down from my in-law's family, and it's one that I absolutely cherish. Throughout the year, we're always on the lookout for an ornament that can capture a particular adventure or special milestone for every member of the family. The Christmas Tree Trimming Party is when these new meaningful ornaments are unveiled and bequeathed, often along with a story. On the year that I had organized a Morel Mushroom Hunt early in the spring, Heather gifted me with a beautiful collection of mushroom ornaments in honor of my love for fungi foraging. Not long after that, I responded with a set of dinosaur ornaments, in honor of her very dino-fascinated son, Benny. And of course, the Obama ornament comes out every year to remind us of the good old days. Our ornament-giving ceremony is one of the best ways to both celebrate and relive our favorite moments from years past. It makes trimming the tree sort of like a living scrapbook — you get to reassemble it every year with the people you're closest to! Whenever Chaunukkah and Christmas overlap, we take a ton of delight in frying up some latkes and lighting the menorah — nothing like a little cross-cultural celebration to truly embody that Bacon & Lox spirit! One year, we each decorated gingerbread houses, all while smoking old-fashioned candy cigarettes. Elena, who had just taken a cake decorating class, was especially excited to put her new skills to use. 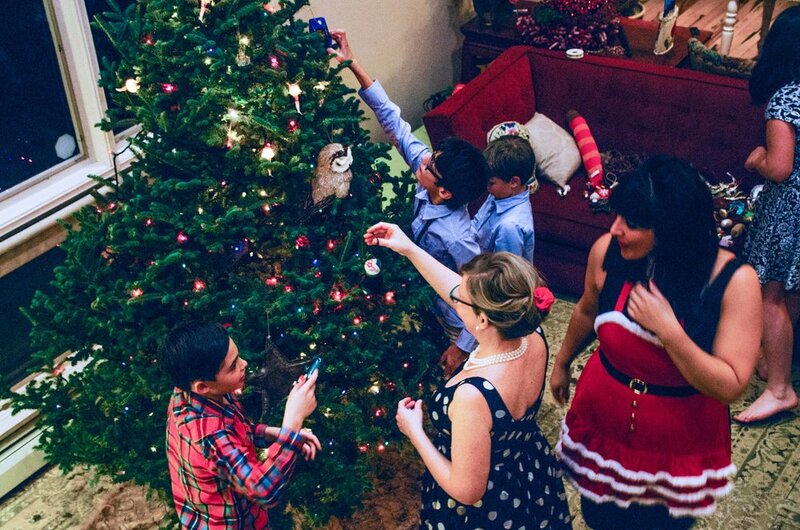 Our Tree Trimming party is a big hit every year, and we're constantly finding new ways to make the evening even more fun. I'll never forget, one year, as Nathan was hanging a mercury glass bulb on a high branch, he leaned into the tree and whispered, "You're going to be beautiful to burn."